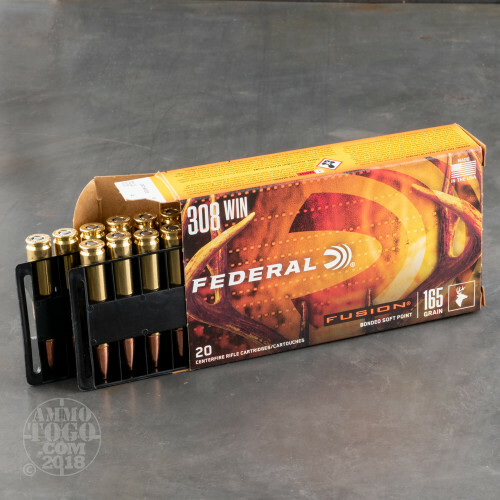 Producing high-quality, innovative rifle ammunition since 1922, Federal Premium is one of the most recognized and respected names in the shooting world. 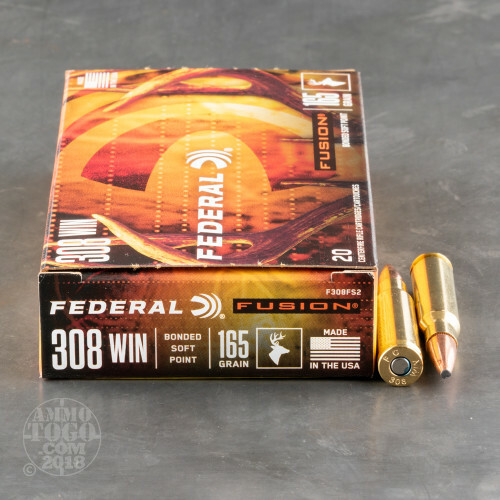 Federal Fusion was the industry’s first rifle ammo engineered for the specific needs of the modern deer hunter. This ammunition is still the best on the market when it comes to hunting whitetails, offering the largest expansion and highest weight retention when compared head-to-head with the competition. Each of these factory fresh .308 cartridges features a 165 grain soft point projectile. Federal Premium Fusion soft points are manufactured using a proprietary bonding process which electrochemically joins a pure copper jacket to an extreme pressure-formed core. The result is a projectile that releases high terminal energy on impact, radiating a lethal shock through the target and delivering quick, humane kills. Leaving the muzzle at a velocity of 2700 feet per second with a muzzle energy of 2671 foot pounds, Fusion .308 soft points feature a top-secret tip-skiving process and deliver impressive bullet integrity. These bullets also incorporate a boat tail design for improved long-range accuracy. 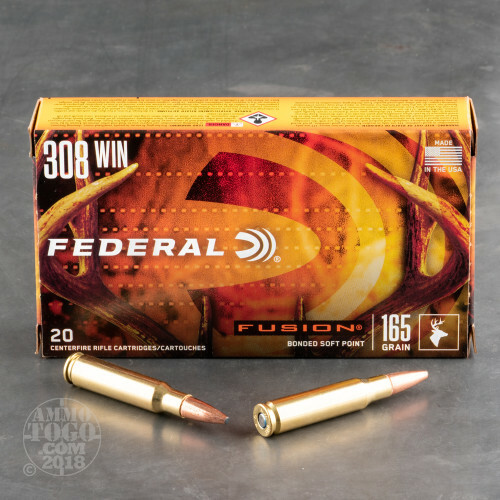 Federal Fusion .308 Winchester (7.62x51) ammunition is factory fresh, 100 percent non-corrosive, boxer primed, brass cased, reloadable, and comes packed in 20-round boxes. I have been using this ammo for years for deer hunting, never had a deer go farther than 20 yards. Shots as close as 40 yards and 180 yards out, broadside and quartering away all 1 shot. 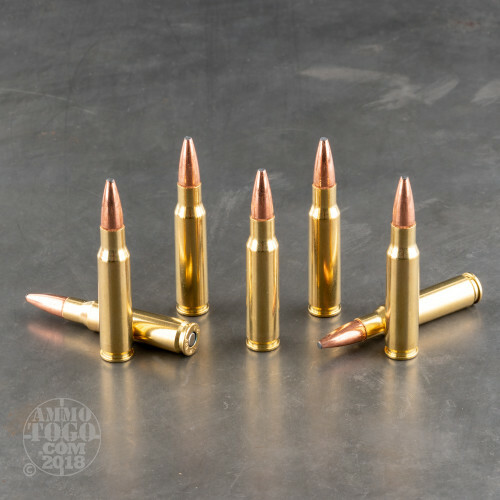 If you are looking for 3/4 inch 100 yard groups this may not be your ammo but it will shoot 1 1/4 to 1 1/2 inch 100 yard groups all day.